Testimonials. OK! I admit it. 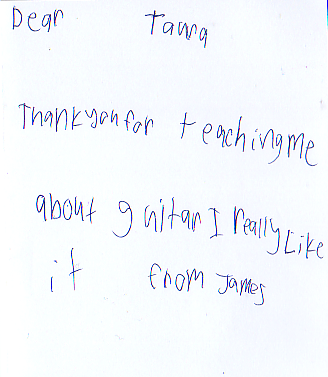 I have not been systematic with testimonials for guitar lessons. Even bigger shame when I can't even put my hands on ones that just came in at Xmas. 2009. So the ones that I display on this page are especially valuable. Even moreso for surviving my negligence. OK. Enough brow beating. Let's get started with the gold. Who else but Facebook, (in 2010 at least!) should start the Testimonials running? Max was really happy and proud on himself when I picked him up. Did some extra practice that evening. Do we need to buy another book? they are looking forward to next term as well. Thank you so much for al your help and knowledge. Just to let you know that Alex is thoroughly enjoying his sessions with you. We wish we had known earlier that he wanted to play guitar. On Alex's behalf, I would like to thank you! He has loved guitar lessons which I am thrilled about. He is so proud that he can play a song and he picks up his guitar whenever he has a spare minute to practise. See you again after the holidays. Thanks so much for all the work you have done with Alex this year. It has made a huge difference in his life. Just thought I would pass on the following re James McK..
After the lesson I asked him if he enjoyed it. To which he replied "Yep.... Actually I loved it"
Thanks for all your patience over the last year and a half, I've really enjoyed your lessons. Hopefully take up where I left off in the not too distant future. 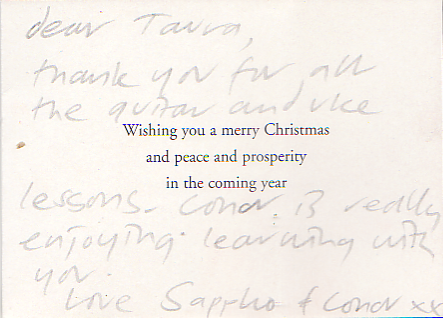 "Thanks for having confidence in me"
Thanks Taura for the guitar lessons. I found them very easy to follow and you were an extremely patient teacher. Thanks for having confidence in me. "You can imagine my surprise and delight to be able to play several tunes by the end of my first lesson"
My name is Arrianna and I have always wanted to play guitar but thought that at the age of 37 yrs, this was perhaps an unrealistic dream as I am way past the age of developing fine motor skills. I planned to take lessons on the sly to surprise my guitar playing partner with a tune or two in the distant future. You can imagine my surprise and delight to be able to play several tunes by the end of my first lesson. By the end of my second lesson I was confidently playing one of my favorite songs, "Summertime" using both major and minor chords. During that week I was sitting out on the deck playing and singing "Summertime" when my partner heard me and came to check me out. He stood there in surprise and exclaimed "What the hell!" I grinned and told him I'd had TWO guitar lessons with Taura. To which he replied,"Damn! I think I'm going to book in for lessons too." During the week following my third lesson, not only was I able to play all the songs in my Guitar Lesson Book One but I was also playing another one of my favorite songs which wasn't in the lesson book. I am so excited and cannot wait to practise more of the songs I love. I would encourage anybody who has always dreamed to playing guitar, but has been tentative, to give Taura a call. He is a fantastic teacher and you will be surprised what can be achieved in such a short time. "I walked away from my first session with Taura, excited and inspired"
I walked away from my first session with Taura, excited and inspired. I never thought I'd ever be able to play barre cords let alone be using them to play songs - but that's what happened after the first session. I'd not only learnt 3 different tunings for my guitar but also how to adjust the cords of a song so I could sing them in a key that suited my voice - definitely a bonus as I do love to sing while I'm playing. I particularly enjoyed the fact I was learning skills to play "by ear" - I'd really like to be able to hear a song and have the ability to recognise the cords. Having a strumming pattern helped add interest to my playing and has made me more aware of strumming patterns in songs that I hear. I really recommend this course. It's so easy and lots of fun. "You managed to sort out all my bad habits"
A few words to thank you for your guitar lessons. Even though I have been carrying a guitar around for half of my life i never had the luxury of time to engage in uitar lessons so I feel p[rivileged to have had you as my first guitar teacher. You managed to sort out all my bad habits and introduce me to a side of guitar playing I would never have though of. I will never look at a cord as a simple cord anymore. Thanks once again for your time and encouragement. Alex Pamnent - Player of 20 years, Viaduct Harbour. "I was stunned to be actually playing songs straight off." I had my first lesson yesterday, and it was awesome. It was much easier than I had expected, in fact I was stunned to be actually playing songs straight off. Given the fact that I was an ABSOLUTE beginner and had never even strummed a guitar before, I had expected to spend a few lessons being taught chords and technique and more technical things rather than getting straight into it. It was really rewarding, and I've already been practising Amazing Grace today. I want to learn to play the guitar to make music, and I think your way of teaching is going to help me achieve that very early on. As a first lesson it was easy, comfortable, rewarding and inspiring. My Dad tried to learn a few years ago and gave up after 6 months. He found the way he was being taught tedious and unrewarding. He spent so much time practising difficult chords and only by the end of the 6 months had he started to play actual songs.